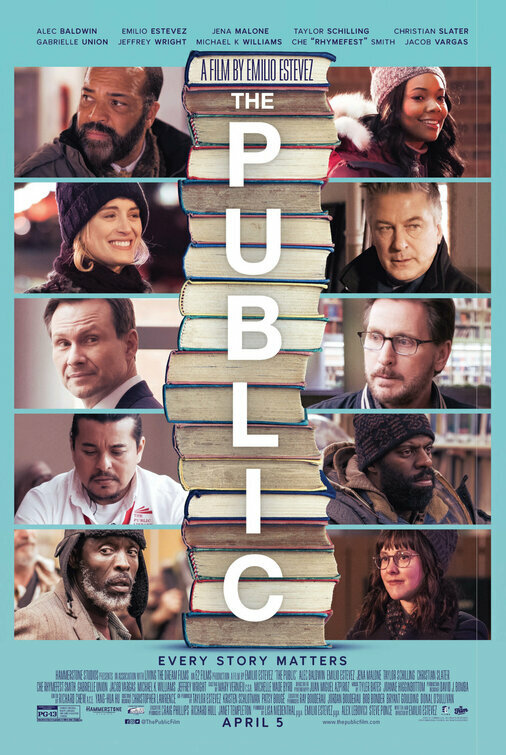 FILM REVIEW – THE PUBLIC. With Emilio Estevez, Alec Baldwin, Jeffrey Wright, Christian Slater, Gabrielle Union. Written and directed by Emilio Estevez. Rated PG-13 for sequences of fantasy violence, some disturbing images, brief suggestive content, thematic material and language. 116 minutes. It’s nice that Emilio Estevez’s THE PUBLIC – he wrote, directed, and is part of the ensemble cast – is getting a theatrical release, no matter how limited. It is an earnest film about contemporary society that most viewers will end up discovering in the months and years to come on some streaming service, wondering how come they never heard of it. Those looking for a movie about things that matter rather than superheroes or zombies might want to take a look. The place is the central public library in Cincinnati. Stuart Goodson (Estevez) works there and interacts not only with the library’s patrons, but the city’s homeless who use the facility as a makeshift shelter. During a severe cold snap, when the city’s actual shelters are overwhelmed, a group of homeless men led by Jackson (Michael Kenneth Williams), decide they’re not leaving. With Goodson’s help, they’re going to occupy the library. Estevez’s script shows how this action impacts a variety of actors, from a tough-on-crime prosecutor running for mayor (Christian Slater), the police detective handling the impasse (Alec Baldwin) whose own son may be among the homeless, and a local TV reporter (Gabrielle Union) who sees the story as her ticket to big time. Others who have personal relations with Goodson, including his boss (Jeffrey Wright), a co-worker (Jena Malone), and a sympathetic neighbor (Taylor Schilling), find themselves caught up in the drama as well. Like his father, actor/activist Martin Sheen, Estevez is more interested in making a point than in making a blockbuster. He makes sure that several of the homeless men become real people to the viewer, and not just pawns in the story. While some are mentally ill or otherwise impaired, like Big George (Rhymefest) who believes he can shoot lasers out of his eyes, others are simply men who have fallen on hard times. For Estevez, calling for law and order is not a proper response to people in need. He’s assembled an outstanding cast here, and they don’t let him down. Slater’s cynical pol and Baldwin’s cop who appreciates the complexities of the situation are obvious callouts but look at Williams as the homeless Jackson. You may not know the name but he’s instantly recognizable to fans of “The Wire” and “Boardwalk Empire.” Estevez is a generous director, making sure each of his principals get their moments to shine, with Union’s self-absorbed reporter providing both a repulsive character and a memorable performance.